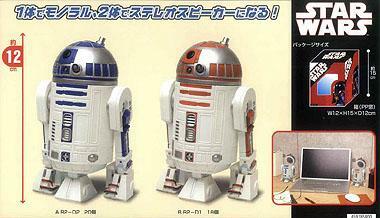 «©NCSX» Taito shapes audio speakers into the likeness of R2-D2 and adds another "must have" product for the über fan who has everything remotely related to the Star Wars franchise. When you're in the mood for some tunes, flip the droid's dome up to reveal the speaker. Once music time is over, smack the dome down and it's just a droid. Pricing is set at US$25 per speaker. Please purchase "2" if you want a matching pair in blue or red. Note: The audio volume level of the R2-D2 speaker is fairly low and there is no volume control knob to adjust the volume. Due to this constraint, this item is more of a novelty item rather than speakers that are suitable for everyday use. Thanks for reading.